One of the traditional characteristics of Theravada Buddhism is that the teachings of the Buddha are made freely available to those who wish to receive them. 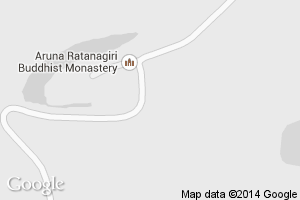 Following this tradition, at Aruna Ratanagiri Monastery, no charge is made either for teachings or for accommodation. The Monastery runs entirely on a donation basis, and depends for its continued existence and development upon the generosity of its lay supporters. Offering support to a monastery benefits the one who offers as well as the recipient, as it helps to nurture generosity and virtue in the one doing the offering. The monastery also benefits, as it enables the community to support itself and provide a source of inspiration and teaching to the laity. In this way the Buddha’s teachings are able to survive and thrive for generation after generation. Here is an overview of the various ways of providing financial support to the Monastery, including making a donation, or through offering food, other requisites or service. All offerings are appreciated. Monks of the Theravada tradition are expected to live in accordance with the original monastic code - the Vinaya. This prohibits monks from handling or holding personal rights over money. Because of this, the finances of the monastery are stewarded by a charitable body, Harnham Buddhist Monastery Trust - and are administered on a day-to-day basis by the Monastery Management Group and theTrust Secretary. Trustees are friends and supporters of the monastery, who serve in this capacity as an expression of their commitment to the Triple Gem (Buddha, Dhamma, Sangha). The secretary is paid for her work by the HBM Trust. The main priority of the Trust is to ensure that the sangha (monastic community) is sufficiently provided for in the form of a place within which to live and practice. However, the sangha itself attaches a great deal of importance to providing a place in which lay people can develop their spiritual life, whether this be formal retreat situations or by individual short-term stays. In order to provide the latter, the Trust has established a retreat facility, Kusala House. Expenditure associated with providing requisites for the monastic residents and for running the guest facilities is met by the Trust’s General Fund, which is primarily sourced from lay donations made in a number of different forms – for details click on link above. In addition to this main operating fund there are also separate set-aside funds for specific purposes. The Endowment Fund was established in order to receive major donations (such as willed bequests) and it is primarily intended that it should provide a regular income that will help to ensure the long-term future of the monastery and supplement any shortfalls that occasionally occur between expenditure and normal donations. The Ageing Samanas Fund is intended to provide for the potential care needs of ageing Sangha members by, for example, enabling them to remain and to be cared for by or within the community. There is also a separate Publications Fund that serves to finance the publication of Dhamma material for free distribution to lay people. If you would like to help and find these details do not provide enough information, please feel welcome to contact us.